Our group broke up along the road but we made good time to our lunch stop in Los Olivos. 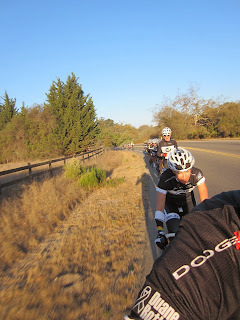 Then climbed up through Solvang and then onto the 101 for a not very pleasant ride into Santa Barbara. All in, about 115 miles. Day 5 takes us to Malibu along almost flat roads. Forecasts are for some strong winds... that could change things. Smoothies! That's was great after 80 miles!